This list represents only a small portion of the McDunnough Inc inventory. It is our weekly "HOT LIST". All recycled plastic materials are in stock and ready to ship. If we don't have the recycled plastic product you are looking for in our inventory we will utilize our vast network of supply chains throughout North America and can usually locate any material within 24 hours. The following recycled plastic materials for sale are FOB Fenton, MI. Please contact us at 734.449.4008 should you require a resin not listed, as we have the capability to create custom pellets to meet your processing needs. 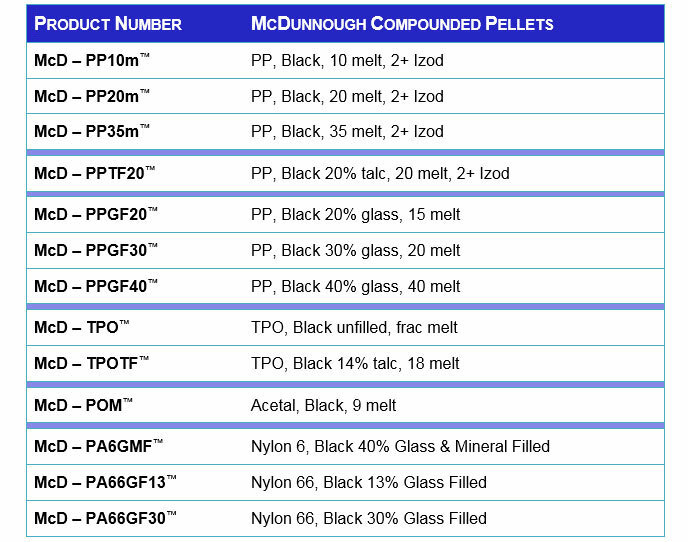 To contact your McDunnough Inc sales representative please call 734.449.4008 or go to our contact page.